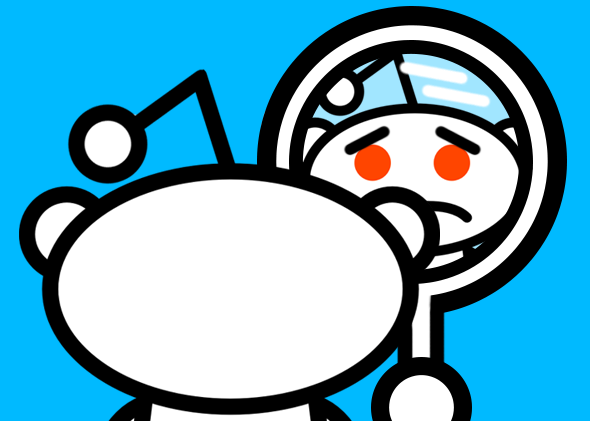 Reddit and the Boston Marathon bombings: How the site reckoned with its own power. One year after turning up false clues in the Boston-bombing manhunt, the site’s users have done some soul-searching. 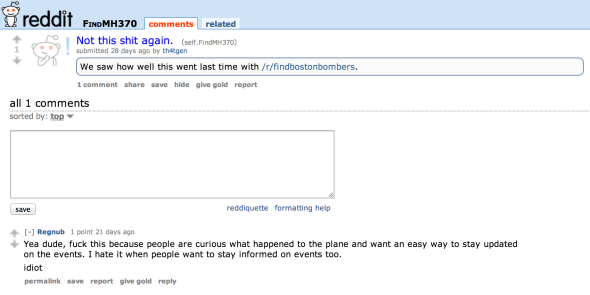 One year ago, after the Boston Marathon bombings, Reddit users created the thread r/findbostonbombers. The idea was to organize the theories and speculations already arising among users drawn to the Reddit’s r/news thread, which provided fast-updating (and largely accurate) information about the event and investigation. The aftermath has inspired a great deal of soul-searching in a community intimate enough that most posts refer to Reddit as “we” or “us” but vast enough to include 6 percent of adult American Internet users. The original moderators and users of r/findbostonbombers (which has since been made private) attempted to enforce strict rules, which prohibited posting personal information, limited the spread of information beyond the subreddit, and encouraged users to leave law enforcement to professionals. But as the activities of the subreddit, or sub, attracted media attention and an influx of new users, things quickly spiraled out of the control of the handful of volunteer moderators. After circulating on the thread, a picture of Boston-area teenager Salaheddin Barhoum and 24-year-old grad student Yassine Zaimi appeared on the cover of the New York Post (headline: “BAG MEN”). Most infamously, the crowdsourced investigation wrongly pinpointed the missing—and, it turned out, deceased—Brown University student Sunil Tripathi as one of the bombers. The New York Times Magazine and, more concisely, Slate’s Will Oremus both produced excellent analyses of the maelstrom of unsourced information that spread Tripathi’s name in connection with the bombings. It required the eagerness of a large group of anonymous commenters to discuss unsupported speculation within the confines of Reddit. But it also required complicit reporters, including BuzzFeed’s Andrew Kaczynski and NBC News’ Luke Russert, to spread that same unsourced information, backed with their IRL journalistic credibility. And it seems Reddit has learned a lot. Subreddits devoted to the ongoing mystery around MH370 mostly eschew promoting speculation among users. The only media interest in the sub’s activities resulted, unfortunately for Reddit, when the eminently unreliable Courtney Love received attention for tweeting suspicious photos that had been discussed on the site (which only further tarnished any flow of information from anonymous boards to cable broadcasts). A subreddit called “r/findnavyyardshooters”—created in the aftermath of the September 2013 Washington Navy Yard shooting—was almost immediately shuttered by the site’s administrators. Martin also hopes we’re asking these same questions of the journalists who tweeted Tripathi’s name. As Oremus pointed out in his July Slate piece, the real lesson here is to be “wary of each platform’s pitfalls.” However ill-advised it may be to promote this kind of anonymous brainstorming of culprits after a national tragedy, the real damage was only done when the sub’s internal rules—prohibiting posting personal information or sharing content outside the sub—were broken. A few prominent media figures were then essential in amplifying infractions and speculation into full-blown national coverage. Redditors have realized that their theoretically anonymous voices can and will be the subject of serious consideration from outside observers. Though this porous relationship between content, consumption, and conjecture is still far from perfect, r/findbostonbombers provided a wake-up call to both sides of the /r/ to take their respective uses of the medium more seriously. It’s not really fair to hold up a group of people having a speculative conversation among themselves to the same level of responsibility as journalists. But if Reddit continues to exert such a massive influence over what becomes popular and visible online, it’s a responsibility they’ll continue to bear. I could end this piece with a Spider-Man reference that surely most of us redditors will recognize—“With great power comes great responsibility”—but instead I’ll include the entirety of posts in the r/findmh370 subreddit, which nicely summarizes where Reddit stands.